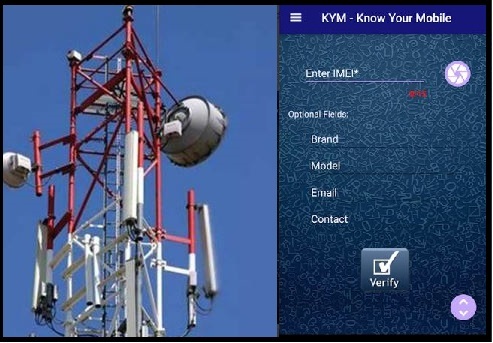 As per the recent notification by India's Department of Telecommunications, mobile users can now make an IMEI verification with 'Know Your Mobile' (KYM) Application. With this KYM app, mobile users and can get all information related to that device as registered in the global GSMA database. With this KYM app, mobile users can also check for the blacklisted number. Here, it can also scan barcodes printed on the mobile cover box to get IMEI of your device. With this KYM app, information provided for an IMEI number includes Bands Supported, Manufacturer of a device, Brand Name and Model Name of your device. The Know your mobile (KYM) app is available for download in Google Play store for Android users and Apple store. Mobile users can also check manufacturer, device model, etc of a mobile handset/device from its IMEI number by sending SMS "KYM " to 14422. IMEI: The International Mobile Equipment Identity (IMEI) number is a unique identification or serial number that all mobile phones and smartphones have. It is normally 15 digits long.